NIIFT is a leading Institute for higher education in the field of fashion. The courses offered are designed to tap and develop the creative intelligence and managerial skills of individuals, thereby producing potential professionals and designers. A three year undergraduate degree program after 10+2 is designed for those interested to make their career in the dynamic and charismatic world of Fashion Design. The course is divided into six semesters, which gradually evolve and sensitise the student’s understanding of fundamentals of fashion business. A three year undergraduate degree program after 10+2 is designed to cater to the specific demands of the fast-emerging Textile and Knitwear industry. Areas of study include skill development, knitting knitwear designing, dyeing and printing, knitting technology, production and merchandising. SC Candidates: Candidates applying under this reserved quota would have to produce a Caste/Tribe certificate from Competent Authority of respective State /Union Territories/National Commission of Tribes. PH Candidates: Candidates seeking admission under this physically handicapped quota must produce a Disability Certificate issued by Medical Board attached with Vocational Rehabilitation Centre (VRC) working under Ministry of Labour, Govt. of India, certifying their disability as 40% or more. Foreign/NRI Candidates: 07 seats in each discipline are reserved for admission of Foreign Nationals whether residing in India or abroad, applicants from Non-Resident Indians are as specified in Income Tax Act 1961. Candidates belonging to General Category are required to make payment of Rs.1750/- either direct online payment through Credit Card/Debit card/ Net Banking to AIMA or in form of Demand Draft of Rs.1750/- in favour of NIIFT Mohali. Candidates belonging to SC/ST/PHP Category are required to make payment of Rs.440/- either direct online payment through Credit Card/Debit Card/ Net banking to AIMA or in form of Demand Draft of Rs.440/- in favour of NIIFT Mohali. Send the duly completed Print Version of Online Application Form having Auto Generated Application No. to “The Project Manager CMS, All India Management Association, Management House, 14, Institutional Area, Lodhi Road, New Delhi-110003”. Registration Process will be completed only on receipt of Print Version of Online Application Form. Eligible candidates applying for both UG & PG Programs have to fill separate online application forms and have to submit separate print out of filled application form containing different auto generated application number along with separate demand draft of requisite fee. 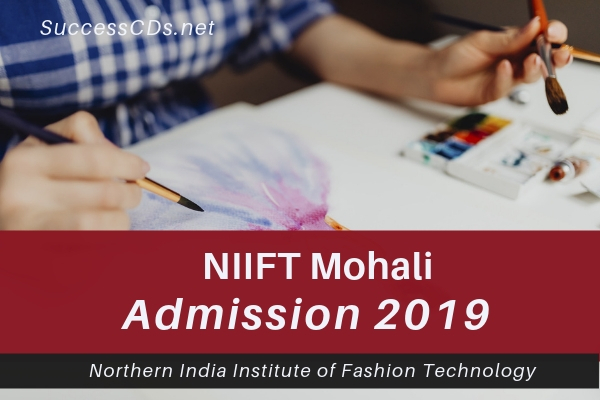 On the basis of the information given in the NIIFT Application Form, Admit Card of provisionally eligible candidates will be available to the candidates for download from the NIIFT Website on or after 29th May 2019 (14:00 hours). On such downloaded Admit Cards the candidates are required to affix their photograph (similar to that affixed on the Application Form) on the downloaded Admit Card and get it attested by a Gazetted Officer/school Or College Principal for producing at Exam.